Humphrey Bogart and Mary Astor in Across the Pacific. 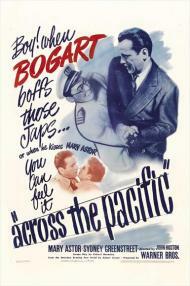 Across the Pacific is one of those great propaganda films made during World War II. Although I had never seen this movie before, I found many similarities in it to other films. Several movies have "borrowed" elements from this film. Released in 1942, it involves a Japanese plot to bomb the Panama Canal. Considering that Pearl Harbor was attacked the previous December, this movie probably affected quite a few viewers at the time. It works as a rallying cry against the Japanese. The movie plays up Japanese stereotypes. One Japanese gentleman wears little round cliche glasses. When a Japanese man talks to Rick Leland he of course pronounces it Rerand. Politics aside, Across the Pacific is a great espionage thriller. Some 60 years before The Departed, Bogart played a uniformed man who pretends to be disgraced by breaking the law so as to get in good with some bad guys. He takes a ride on a Japanese ship and ends up getting involved with all kinds of questionable people. None of which, turn out to be who they pretend to be. This movie almost plays like a pre-quel to Casablanca, which would be Bogie's next movie. In both films, Bogart plays a mysterious white trench coat wearing man named Rick who has a friend named Sam. Had his pretend fall from grace been real you can quite easily see Rick Leland running off to Europe and meeting Ilsa. Although it does not contain the plethora of Casablanca's great lines, Across the Pacific does contain Bogart's best tough guy dialogue, "When you're slapped, you're gonna take it and like it." This movie also contains a line that Animal House would steal some 35 years later. At one point Bogart and Greenstreet each pull out pistols to which Bogie says, "Mine's bigger than yours." Okay so it's a cucumber in Animal House, but the innuendoes the same.